The final story in Book 7 of Ovid’s Metamorphoses is its best, and a true jewel in the author’s crown. Although it has been told elsewhere, this account is by far the best. It is told by Cephalus, the envoy from Athens, to the sons of King Aeacus on the island of Aegina, following the king’s account of the Myrmidons. Having told Cephalus of the plague and the Myrmidons that followed it, King Aeacus falls asleep, so his son Phocus takes Cephalus and his companions to their accommodation. There Phocus notices the unusual javelin which Cephalus is carrying, with its gold tip on a shaft of wood which he cannot identify. This leads Cephalus to tell him that the javelin killed his wife, and so to explain the circumstances. Within two months of his marriage to the beautiful Procris, when he was laying nets to catch a deer at dawn, Aurora saw Cephalus and tried to abduct him (she has a track record of affairs with humans). Cephalus protested and explained to Aurora his love for his wife, and she let him go, warning him that if Aurora saw him again, he would regret ever marrying Procris. Cephalus yearned for his wife, so begged her forgiveness, and admitted that he too would have given way when made such an irresistible offer. Procris returned to him, and the couple lived happily again together. She brought back with her gifts from Diana: a hunting dog who outran all other dogs, and the unusual javelin. just in the act of barking and pursuit. Ovid ends the book with Cephalus and his audience in tears, as Aeacus arrives with his other two sons and the army which they have been raising to counter the forces of Minos, setting the scene for the start of Book 8. In complete contrast to Aeacus’ story of the Myrmidons, that of Cephalus and Procris has proved very popular with painters, and has been told by several of the great Masters. Those paintings concentrate on two scenes from this long story: the abduction of Cephalus by Aurora, and the death of Procris by Cephalus’ javelin. 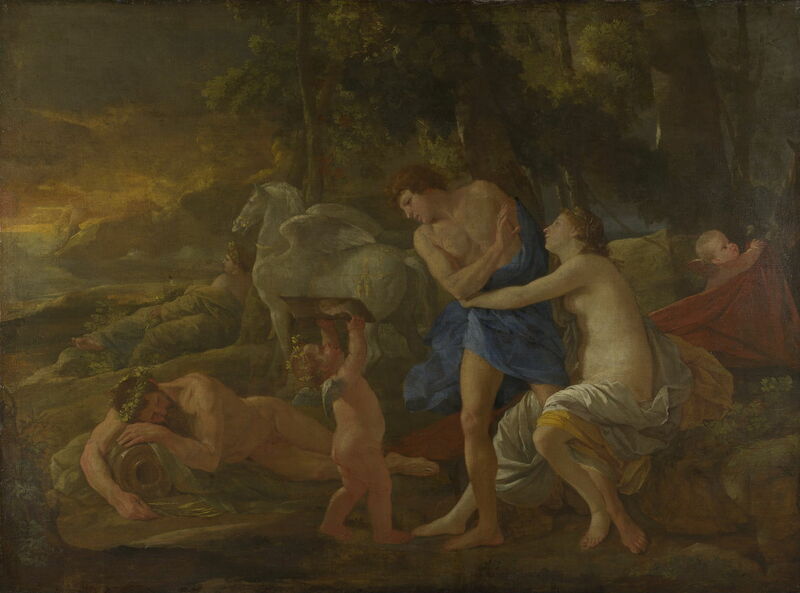 Nicolas Poussin’s Cephalus and Aurora (1630) shows the dawn scene of Cephalus trying to avoid the obviously amorous intentions of the goddess Aurora, who is seated and nearly naked. Behind Cephalus is the winged horse which draws the chariot of the dawn. A winged putto is holding up an image for him to view, presumably showing Procris, to help his resolve. At the left is a river god. Beyond the horse is another deity bearing a coronet: although it is difficult to see, that might be Diana, given her association with hunting and this myth. Peter Paul Rubens (1577–1640), Aurora Abducting Cephalus (c 1636-37), oil on oak panel, 30.8 x 48.5 cm, The National Gallery, London. Wikimedia Commons. 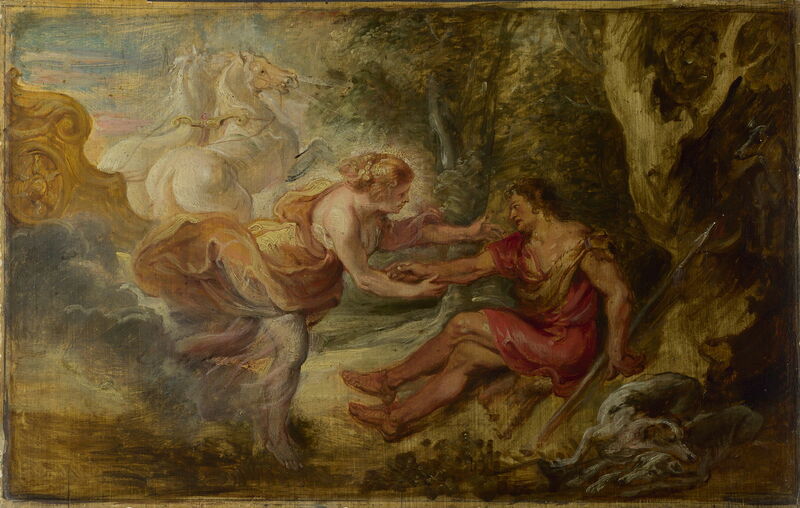 Peter Paul Rubens’ oil sketch of Aurora Abducting Cephalus was probably made in 1636-37, late in Rubens’ life, for his workshop to complete a painting for King Philip IV of Spain’s hunting lodge at Torre de la Parada, near Madrid. In addition to showing the willing Aurora trying to persuade the reluctant Cephalus to join her in her chariot, it includes some details which are at odds with Ovid’s story: Diana’s hunting dog and javelin, which Procris gave to her husband after their reconciliation, later in the story. Here they may be intended as attributes to confirm his identity. Over the following couple of centuries, there was a steady stream of paintings showing the abduction of Cephalus, but to my eye the next major work using this theme was Pierre-Narcisse Guérin’s romantic Aurora and Cephalus (1810). 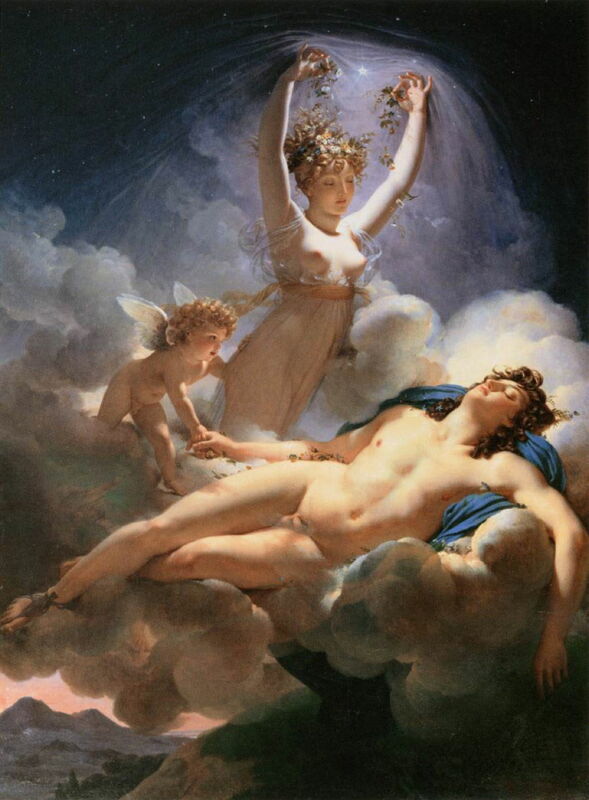 Instead of a substantial chariot, the seductive figure of Aurora is bearing a sleeping Cephalus aloft on a bed of cloud, as dawn breaks over the mountains below. This fails to show any resistance on the part of Cephalus, though. Pierre Claude François Delorme (1783–1859), Cephalus Carried off by Aurora (c 1851), oil on canvas, dimensions and location not known. Wikimedia Commons. Forty years later, Pierre Claude François Delorme uses a similar motif recomposed into his Cephalus Carried off by Aurora (c 1851). This features interlocking arms and embraces quite ingeniously: Aurora cradles Cephalus’ shoulder and chest, Cephalus reaches out to Cupid, and Cupid back to Cephalus. To modern tastes, the cherubic faces in the cloud behind Aurora are a little overdone, I suspect. Of those paintings showing the tragic death of Procris, the greatest has to be one of the earliest, Paolo Veronese’s Cephalus and Procris (c 1580). Paolo Veronese (1528-1588), Cephalus and Procris (c 1580), oil on canvas, dimensions not known, Musée des Beaux-Arts de Strasbourg, Strasbourg, France. Image by Amada44, via Wikimedia Commons. In the foreground, Procris has fallen, the javelin embedded in her upper abdomen, and her life is fading fast. Cephalus isn’t embracing her, though, merely holding her hand as he tries to plead his innocence. Veronese leaves us with two small puzzles too. The first is the large hunting hound behind Cephalus’ right shoulder, remembering that Diana’s dog was turned into stone while hunting the beast of Thebes. Even more puzzling is another figure, and a second dog, in the distance, at the left edge of the painting. These might represent the first part of the scene, before Cephalus throws his javelin, in multiplex narrative. Peter Paul Rubens (1577–1640), Cephalus and Procris (1636-37), oil on panel, 27 × 28.6 cm, Museo Nacional del Prado, Madrid. Wikimedia Commons. 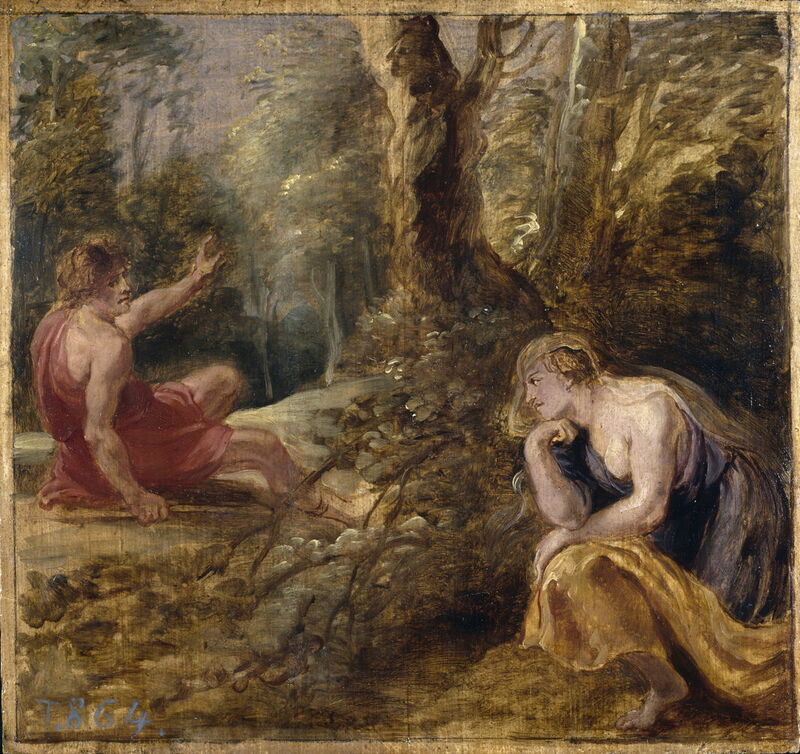 Peter Paul Rubens offers another oil sketch, of Cephalus and Procris (1636-37), which shows the couple just before Cephalus throws the fateful javelin, which rests at his side. There is another painting which has been claimed to show The Death of Procris, but which is more accurately titled A Satyr Mourning over a Nymph, made by Piero di Cosimo in about 1495. Piero di Cosimo (1462–1521), A Satyr mourning over a Nymph (or The Death of Procris) (c 1495), oil on poplar wood, 65.4 × 184.2 cm, The National Gallery, London. Wikimedia Commons. A brilliant painting, it uses the full width of a panoramic panel to show a satyr with his goat legs and distinctive ears, ministering to a dying or dead nymph, who has a severe wound in her throat. At her feet is a hunting dog, with another three in the distance. There is no reason to show Cephalus as a satyr; Procris was impaled in the chest by the javelin; Procris was behind cover, where she was spying on Cephalus, not out in the open; and Cephalus had only one hound, a gift from Diana, which had in any case already been turned to marble. It’s a superb painting of another, quite different, story. I think that I’ll take Guérin’s Aurora and Cephalus, wondering whether Cephalus really did reject Aurora’s advances, and the Veronese to complete this tragic tale. Posted in General, Language, Life, Painting and tagged Cephalus, Delorme, di Cosimo, Guérin, Metamorphoses, myth, narrative, Ovid, painting, Piero di Cosimo, Poussin, Rubens, Veronese. Bookmark the permalink.